병마절제도위 윤양계가 1873년(고종 10)에 건립한 집으로, 앞으로는 하천이 흐르고 뒤로는 나지막한 산이 둘러싸고 있다. 원래는 대문과 행랑채에 나 있던 중문을 통해 사랑채로 출입하였는데, 행랑채와 중간 담이 모두 무너져 현재는 대문을 들어서면 바로 사랑채로 출입할 수 있다. 이 집은 건물의 배치에서 독특한 점이 살펴지는데 앞쪽에 넓은 마당을 두고 '一'자형의 안채를 중심으로 안채와 직각으로 서쪽에 아래채를 두고 동쪽에 사랑채가 안채와 거의 병렬로 배치되어 있다. 일반적으로 사랑채는 안채를 가로막고 서있는 것과 달리 안채의 동쪽에 비켜 앉아 별당처럼 되어 있다. 이렇게 사랑채와 안채가 일렬로 배치되는 경우도 흔치 않지만 안채 규모만한 아래채가 안마당에 별도로 있는 경우도 거의 없다. 또한, 이러한 배치의 독특함과 아울러 사랑채의 구조와 규모에서도 특이한 점이 엿보이는데 안채에 비해 사랑채의 규모가 다소 작아 마치 별채와 같다. 한편 안채의 평면형식 또한 특이한 점을 발견할 수 있는데, 전체적으로 '一'자형을 취하고 있으나 안채 오른쪽이 대청과 연결되어 앞으로 2칸 돌출되어 건넌방으로 되어 있다. 건넌방으로 쓰기에는 규모가 상당히 크며 대청과 그리고 오른쪽으로 뻗어 나온 고방과도 연결된다는 점에서 이 방이 기능적인 측면에서 단순히 건넌방 이상의 용도로 사용했을 것으로 추정된다. 19세기 중엽에 지어져 다소 시대가 떨어지는 집임에도 불구하고 중부 서해안 일대의 안채와 사랑채 등의 정형적인 주택의 배치와 달리 중부 내륙에 해당하는 지역에서 이렇게 자유스럽고 흐트러진 배치를 보인다는 점에 있어서 지역에 따른 배치방식의 차이를 보여주는 좋은 사례로서 학술적 가치가 있다. This house has a brook on the front and a low hill at the back. 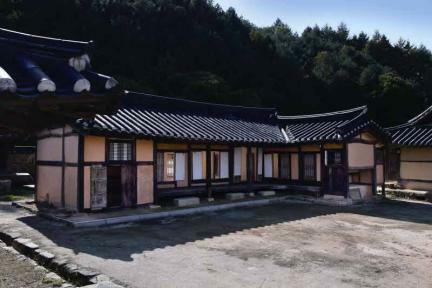 To enter the sarangchae (men’s quarters), one originally needed to pass the main gate and the middle gate in the haengnangchae (servants’ quarters), but both the haengnangchae and the middle wall were destroyed; thus, the sarangchae is directly seen from the main gate. 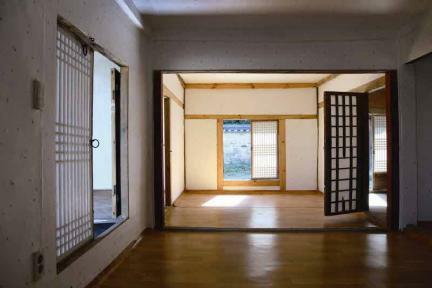 The sarangchae has a small side wooden veranda on the front and back sides, and all rooms are equipped with an underfloor heating system except the wood-floored rooms. 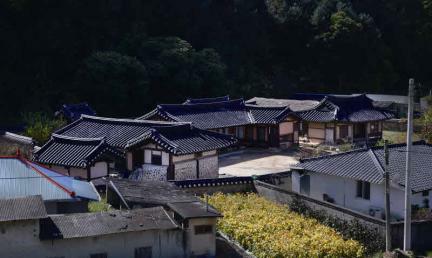 Situated on the left of the sarangchae, the anchae (women's quarters) consists of a kitchen, the anbang (main room), the daecheong (main wooden floor), and a room across from the anbang. On the back of the anchae is a shrine with neither fence nor gate. 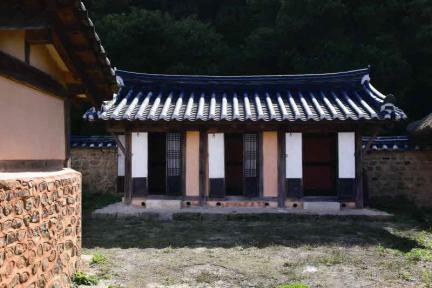 The gwangchae (storage building) consists of a room, a kitchen, and a storage room; it is on the right of the anchae. 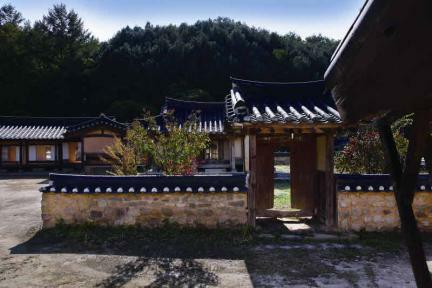 A little gate between the gwangchae and the sarangchae is linked to the rear garden of the sarangchae and a back courtyard. This house has various outside spaces. It is estimated to have been built in the mid-19th century. 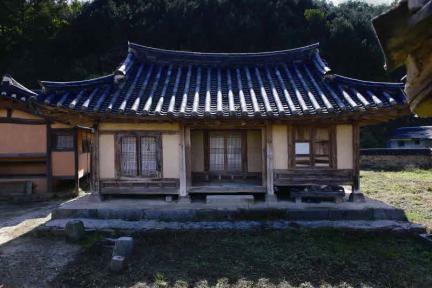 Due to the construction of Chungju Dam, nearby important houses were moved or destroyed; thus, this house is designated as important cultural heritage to preserve it. Academically valuable, it has different characteristics from other houses in the central areas of Korea or near the west coast. ※ Viewing of the cultural property above is limited, so please check the availability beforehand.